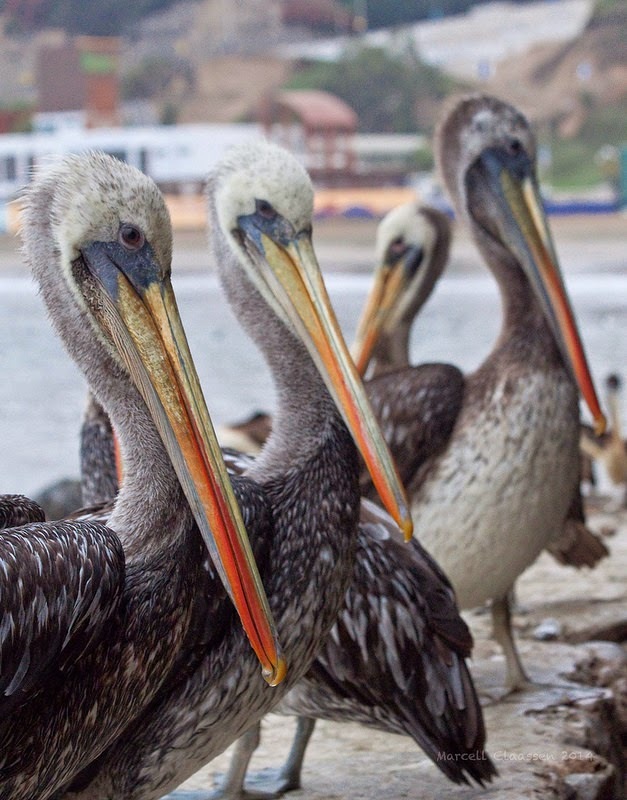 Just after 7am we headed off from the backpackers I was staying at in Miraflores area, to Pantanos de Villa, stopping along the way at a spot along the malacon where the most obvious birds were the pelicans and gulls. The Peruvian Pelicans were very clearly not bothered about the proximity of humans, not that the gulls and terns were! Very excitedly Gunnar points out a Peruvian Seaside Cinclodes, and then move over to get a better look at the different age Belcher’s and Grey Gulls. I went on high alert when an Inca Tern was pointed out, a bird I’ve been gagging to see for a very long time now. Trying to get a shot of one flying, Gunnar points one out perched a few metres away from us. This is just such a stunning looking bird! Luckily it was obliging and I managed to get some good shots. Off we went again to Pantanos de Villa, a 263 hectare protected area with wetlands and along the beach in the district of Churrillos - south out of main Lima. A brief stop on the way at a service station got me some food - my first empanada and a large baguette-like roll with cold meats and cheese. Seriously delicious, or maybe just starving too, I was now ready for some serious birding! The next few hours was a flurry of birds, all bar one or two, brand new species for me! On the water /dams and in adjacent reeds were Grey, Franklin’s, Grey-hooded, and Belcher’s Gulls, a couple of Puno Ibis, Neotropic Cormorants, Little Blue Heron, Great White Heron, Moorhens (Common Gallinule) and Cinnamon Teals. A couple of Pied-billed Grebes were around with some Snowy Egret around the edges. The beach-side had a lot of American Oystercatchers, Black Skimmers (100+) and the odd Elegant Tern. Flying over and along the huge shore-break, were Peruvian Boobies, Peruvian Pelicans, Kelp Gulls with guest appearances by Red-legged and Guanay Cormorants. Wandering back past the reeds and toward the more open grassy areas and wader territory, we got Black-crowned Night Herons, Plumbeous Rail (looks like a Black Crake in Africa) and then also Wren-like Rushbird (after me asking what the warbler in the reeds was!) and a Grassland Yellow Finch. The large distinct outline of a raptor turned out to be a Turkey Vulture also making it’s way up and down the “avenues” between the reeds hunting. The wader area was great with a lot of Black-necked Stilts, Western Cattle Egrets, Greater and Lesser Yellowlegs, Whimbrel and quite a few Killdeer. The star of this area, Wilson’s Phalarope, was spotted by Angelina. We spent some good time here looking what we could find and started making our way back to the road whilst getting great views of Chestnut-throated Seedeater, Striated Heron and a Vermillion Flycatcher. Close to the road I spotted a little owl on some piles of sand; turns out to be a Burrowing Owl - I was well chuffed with my little contribution to the day’s birding! We stopped briefly at the reserve ‘office’ to pay our entry, the very reasonable price of S/-8 per person. Driving back we stopped next tot the road to check out some more waterfowl and found Andean Coot, Great & White-tufted Grebes, Andean Duck and White-cheeked Pintail. A good day’s birding with the majority being new species for me - I was loving being on a new continent again! After buying some roasted chicken and empinada at the nearby supermarket, I worked through my photos of the day but was soon nodding off. So I relented and ended my great day out of the city and went to sleep.